I have always been mystified as to how bagels are actually made, I know that vaguely they need to be boiled before they are baked, and you want them to have that typical chewy texture when you take your first bite. I haven't really done much bread baking before apart from the odd focaccia and we luckily have a bread machine so it can really all be done for you, but there is nothing better than some proper homemade bread. 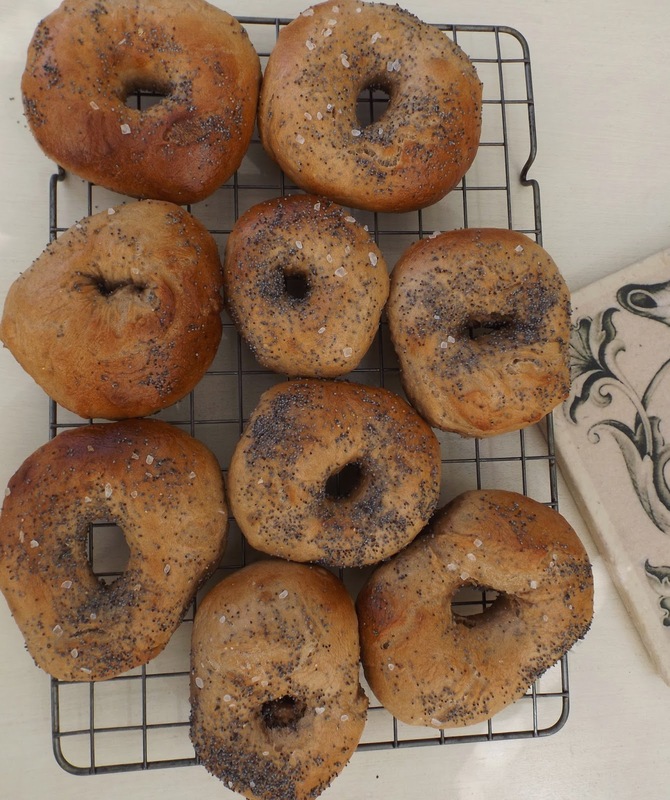 For these bagels, I had the help of a kitchen aid. They are great as they come with a dough hook so the kneading can really be done for you before they are left to prove for about an hour and a half. a good shake of poppy seeds for decoration, along with some sea salt. First combine you flour, cinnamon, salt and sugar in a bowl, turn on the dough hook if you are using a kitchen aid. While you wait for that to mix, put the yeast, 1tbs of golden syrup and the warm water into a jug and put to once side for about 5 minutes. Then with the dough hook running, start pouring in your yeast mixture into the flour mix. Once all added turn to a medium setting and allow it to mix for a good five minuted until your dough has formed and it sticking to the hook. Then divide into 10 balls and using a wooden spoon make a whole in the middle of each one and then work it so it makes a good sized hole, but be careful not to split your dough ring. Next fill a pan with boiling water and the remaining two tbsp of golden syrup. Drop your bagels in 2 at a time in the water for about 30 seconds and then place on a baking sheet. continue until you have done this with each bagel. Then place in the oven for 10 minutes at 220C and a further 10 minutes at 200C. Then pile your batch into a basket and serve with butter and honey for a delicious breakfast or tea time treat.